At first, I felt very strange, really. Everyone who had the chance to have a child know how special, unique, delicate and vulnerable they seem to us. Our heads can’t stop dreaming about their future and about their ability to stand out as a fulfilled and happy human being. Would I be putting my kids’ happiness in jeopardy by speaking with them only in English? After all, I am not a native speaker. Not at all, actually. In fact, it took me years to feel comfortable with the English language. It was only by my twenties that I managed to study English in a local specialized school and take some months to study it abroad in Australia in 1996 (I was born in 1976 in Rio de Janeiro). After that, I had the chance to travel around the world, using English increasingly as a lingua franca, practically everywhere. Even today, living in São Paulo, I would say I spend some 30% to 40% of my time in this language. But getting back to my case, the feeling wasn’t good, I can assure. Would I mess up with my kids’ brains? Would I end up teaching them an awful bad English that would compromise their ability to learn it properly later? Would I be responsible for future problems in their relationship with the world? Was I being a traitor to my own culture and succumbing to the strong forces of globalization? The vast majority of the knowledge in the world today is developed in English language, I feel they deserved to have access to that since childhood. I would love them to be curious and English could be an important part of their discovery process. I struggled for months, felling awkward by speaking to my first kid and often with my own wife and relatives – Brazilians like me – in a language that did not belong to us. We are all native Portuguese speakers in my family; in my wife’s family only her grandparents spoke Japanese and only among them. Two relatively distant languages to English. For my surprise and sadness, after few months not only I got confused with this practice but apparently my oldest son too. It took him much longer to speak when compared to his Portuguese speaking toddler colleagues in the kindergarten. I could see him often confused, not knowing what to say in some situations. That really broke my heart. But I kept insisting as I had read many books and blogs about it and they all said bilingual kids would take longer to start speaking. Finally, my son started to respond to my perseverance. His first words, by the age of one year something were all English words like “ball”, “car” and “blue”, although I was almost the only person speaking with him always in English. Interesting, I thought. With time, and with the support of the vast amount of content available in this language I was able to prove to him that the weird language daddy used at home was also used by other people in distant places. However, movies, cartoons and iPad Apps were the only “prove” that this language existed. Without a single native speaker around, curiously, he preferred to watch the content always in its original language, switching all cartoons and movies back to English whenever possible. Still struggling, by the age of two he started to build his own sentences when speaking with me: “daddy, let’s go!”, “daddy, where is mommy?”, etc. Wow! It was working! With time, by the age of three he started, by his own initiative, to apply Portuguese grammatical rules to English language and vice-versa: “este é um grande caixa” literally meaning “this is a big box” when in Portuguese the correct sentence would be “esta é uma caixa grande”. The logic was right but I had to interfere to highlight the differences between both languages. Words of both languages started to appear in each other language phrases, often in funny ways: “daddy, can you fik here with me now?” with “fik” meaning “ficar” (to stay) in Portuguese. “Mamãe, posso take esse brinquedo with me?” (“Mommy, can I take this toy with me?”). I finally started to calm down and gain confidence to keep using English language at home also with other two babies. As the oldest kid grew, by the age of 4, we started to have relatively long and complex conversations about his feelings and worries in English. The learning was now so fast! I now had to teach him only once. It was enough for him to grasp the structures of this foreign language: “daddy, you see the bird yesterday?” to which I responded: “my dear, the correct way to make this question is “daddy, did you see the bird yesterday?””. And he would never make that mistake again. Today, at the age of 5, even though he is studying in a bilingual school (Portuguese-English), I am still the most important reference to him in this language. For a few times, I tried to come up with a Spanish or French “day” but I did not feel good. He would stare at me with that “don’t exaggerate” look. As I didn’t want to put our emotional connection at risk, I told him I am going to introduce him to some other languages, including computer languages, in the future. Still, I feel that if I had another person speaking a third language at home, he would not have problem to pick it up. Now we reached a point where we started developing our English vocabulary together, as I am very transparent with him: “Sorry, son, daddy doesn’t know the meaning of this word. English is not my mother tongue, but don’t worry, we are going to find out its meaning together, ok?” He is not annoyed by my ignorance and learned that I don’t have answers to everything. Soon, I hope to apply the same logic to other human “languages” like mathematics, accounting, sociology and physics. 2) Decide which parent will speak a particular language. 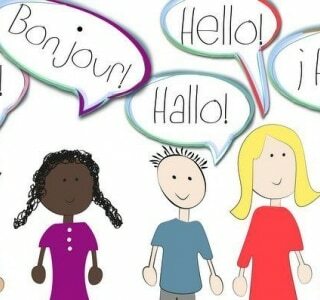 3) Set your goals: do you want your child to just speak or also read and write another language? 4) Provide the kid exposure by regularly speaking in that language. 5) Make it a fun exercise. 6) Read out loud books in the other language. 7) Use images to get the kid to describe it in the other language. My personal conclusion with this daring experiment is that if we do it with love, kids will trust us and make the effort to follow us. That’s how I believe to be developing a special connection with my kids, through this quite useful learning human adventure of classifying everything around us.